This is the blueprint of the Commonwealth, setting out how the new federation would be established and the guidelines for the way Australians would shape their nation. The Constitution is also the blueprint for the lives of Australians, providing the authority for the powers by which our legislators make laws, our executive government implements them, and our courts operate. Examples of the Constitution’s everyday effect can be seen in the answers it supplies to a range of current questions – such as whether the Queen or the Governor-General is Australia’s Head of State (see Sections 1 and 2) or how the Truth about Motorways group could prevent a corporation deceiving ordinary people (through the High Court’s ruling on the purpose of Section 52). This document can explain why everyone entitled to vote in the Australian colonies had a part in shaping this law, and why the Constitution can only be altered with the agreement of a majority of voters in a majority of States. 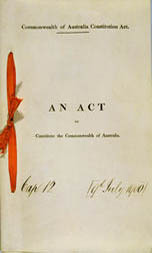 The first two pages of the Act are the nine clauses of the British Act; the remaining 23 pages are the 128 Sections of the original Australian Constitution. These Sections are divided into eight chapters – their headings on page 3 show what is needed to create a new constitutional democracy as a federation, with a monarch as Head of State. The Constitution establishes three ‘arms’ of government: the Parliament (Chapter I), the Executive (Chapter II), and the Judiciary (Chapter III). It covers financial and trade matters (Chapter IV); the federal relationship between the States and the Commonwealth including the formation of new States (Chapters V and VI); the arrangements for a Seat of Government (Chapter VII) and the process for any alteration of the Constitution (Chapter VIII). This document is inseparable from the Royal Commission of Assent, with which it became law; the 100th birthday of the Australian Constitution is 9 July 2000, the date of the Assent. The original Constitution has been amended eight times, in 1907 (S.13), 1910 (S.105), 1929 (S.105), 1946 (S.51), 1967 (S.51, S.127), and three amendments in 1977 (S.15, S.72, S.128). It was not really certain that all six Australian colonies would join the Federation even when this Act passed both Houses of the British Parliament. As each was a ‘sovereign’ colony, with a Governor appointed by the Crown on the advice of the British Government, each colonial Parliament had to pass legislation agreeing to become part of the Commonwealth, and then hold referendums where all electors could have a direct vote on the issue. The dates of the Federation Enabling Acts and the referendums are shown in the table below – the second referendums were necessary for votes on the amendments to the Constitution made at the ‘Secret Premiers meeting’ from 31 January to 1 February 1899. A ‘Yes’ majority was achieved at each referendum, but in the first New South Wales referendum the size of the majority was not sufficient. The Western Australian referendum was not held until three weeks after the Commonwealth of Australia Constitution Act became law – hence the wording of the Preamble to the Act and Clause 3, which provides for the Queen to issue a proclamation of the date of inauguration of the Commonwealth. In the referendums on the Constitution, women were able to vote in only two of the colonies, South Australia and Western Australia, and few Indigenous people seem to have had the opportunity to be counted. Federation had been in the air for 50 years, and had been formally recognised in the formation of the Australasian Federal Council in 1885, although not all colonies participated. Among the strongest arguments advanced for Federation were the need for a united approach to defence and for a common policy to restrict the numbers of Chinese people entering the colonies. Unlike the other colonies, South Australia had not legislated to limit the entry of Chinese people at the Colony’s ports, and large numbers of Chinese passengers made overland routes to the Victorian goldfields from South Australia, and to Queensland’s Palmer River goldfields via landings on the Northern Territory coast of the Gulf of Carpentaria. As the labour movement gathered strength in the 1890s, so did the opposition to Chinese immigrants, seen as a threat to achieving a fair standard of wages and conditions. There were also influential statesmen such as Andrew Inglis Clark, Alfred Deakin, Edmund Barton, Samuel Griffith and Charles Cameron Kingston who believed in Federation as a means to a democratic independence for a united nation. The first constitutional convention, the National Australasian Convention, was held from March to April 1891, when seven delegates from each of the Australian colonies, and three New Zealand delegates, drafted a constitution and agreed to adopt the name ‘Commonwealth of Australia’. The issue was kept alive, with conferences at Corowa (31 July–1 August 1893), Hobart (Premiers’ Conference 29 January 1895), and at Bathurst (17–21 November 1896). Organisations such as the Australasian Federation League and the Australian Natives Association (all white and all male and all fervent federalists) pressed vigorous campaigns. Other organisations were bitterly opposed and some, like the Women’s Suffrage societies reserved their judgment, carefully considering whether the case for Federation was of benefit to women in their fight for equal status before the law. Another National Australasian Convention was held in three sessions in 1897 and 1898 (Adelaide 22 March–23 April 1897; Sydney 2–24 September 1897; Melbourne 20 January–17 March 1898). The Australian Constitution was thus 10 years in the shaping, starting with the proposals presented to the 1891 Convention, most notably the comprehensive submission of Tasmania’s Andrew Inglis Clark. The draft Constitution Bill was revised by Griffith, Kingston, Barton and Inglis Clark, afloat on the Queensland Government yacht Lucinda, during the Easter break of the 1891 Convention in Sydney. This draft was revived and debated at the 1897–98 Convention, and final changes were made at the ‘Secret Premiers’ Conference’ early in 1899 in order to gain the agreement of all the colonies. Another change was made by the British Parliament when Members insisted on an amendment to enable appeals against decisions of the State Supreme Courts and the proposed High Court of the Commonwealth to be heard in Britain, by the Judicial Committee of the Privy Council. An Australian delegation (Edmund Barton, Alfred Deakin, James Robert Dickson, Charles Cameron Kingston and Sir Philip Fysh) went to London to witness the passage of the Constitution into law but they were unsuccessful in their attempts to ensure that the Bill as agreed in Australia became law. Appeals from the High Court to the Privy Council were not ended until 1968 (federal matters) and 1975 (all other matters). The provision was finally removed when all the States passed legislation and the Commonwealth Australia Act became law in 1986. The Constitution set out the basis for the establishment of the institutions of government of the new nation. The chief institutions are firstly the Parliament, consisting of ‘the Queen, a Senate, and a House of Representatives’ (Section 1) provided for in the first 60 sections of the Constitution (pages 3–13). Secondly, Section 2 provides for the appointment of a Governor-General as the representative of the Crown, and the ten sections of Chapter II set out the powers of the Governor-General and the Executive Council and the functions of the public service departments. The ten Sections of Chapter III provide for the judicial institutions with the High Court as the superior court of the Commonwealth. The Governor-General, the ‘first officer’ in the Commonwealth, formally appoints the Ministers of the Crown. Queen Victoria issued Letters Patent establishing the office of Governor-General on 29 October 1900 and on the same day issued Instructions to the first Governor-General, Lord Hopetoun, a former Governor of Victoria. The Governor-General appointed Edmund Barton as first Prime Minister, and formally appointed the Ministers selected by Barton so that the first Cabinet would represent all the States. Four Premiers became Commonwealth Ministers – Sir George Turner (Vic), Sir William Lyne (NSW), Sir John Forrest (WA) and Sir Neil Lewis (Tas). While the High Court interprets the Constitution, once it became law the Constitution can only be changed according to the amendment provision it contains. This requires a referendum of all Australian voters, and the result must be that the proposed change is agreed by a majority of voters in a majority of States and also by a national majority of voters. This is difficult to achieve and, of the 44 proposals put to referendums in the Commonwealth’s first century, only eight amendments have been successful. Coper, Michael, Encounters with the Australian Constitution, CCH Books, Sydney, 1987. Deakin, A, (with introduction by Stuart Macintyre, And Be One People, Melbourne University Press, Melbourne, 1995. La Nauze, JA, The Making of the Australian Constitution, Melbourne University Press, Melbourne, 1972. Quick, J and Garran RR, The Annotated Constitution of the Australian Commonwealth, Angus & Robertson, Sydney, 1901. Sweetman, Edward, Australian Constitutional Development, Macmillan, Melbourne, 1925. Wicks, Bertram, Understanding the Australian Constitution – The Plain Words, Libra Books, Hobart, 1997. Wood, FLW, The Constitutional Development of Australia, Harrap, London, 1933. Zines, Leslie (ed. ), Commentaries on the Australian Constitution, Butterworths, Sydney, 1977. For more information on the National Australasian Convention see Records of the Australasian Federal Conventions of the 1890s.